Edgar Degas and other impressionist and post impressionist artists studied the masters before them, as they strived to become artists themselves and develop their own unique styles. Three students modeling as musicians. 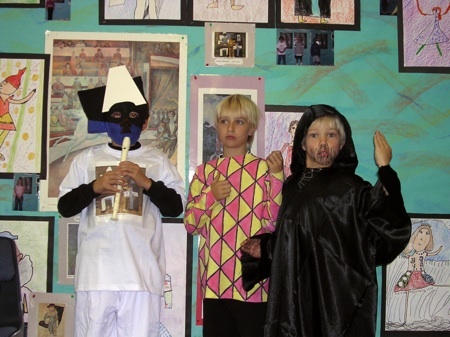 This Living Art Museum Storyline is designed to give students a similar experience as they study the masters, explore their use of the elements of art and design, and experiment using their styles and techniques. Just like the masters, students begin a quest of study and experimentation to create their own artistic styles. 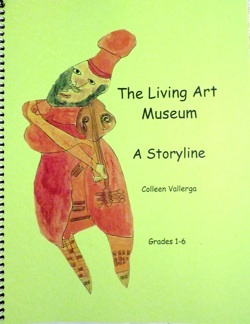 The Living Art Museum Storyline begins with a hook. A backdrop of the painting, Dance in the City, by Renoir, is hung on a bulletin board. Two models are standing in front of the backdrop, dressed and posed with their arms around each other, just as Renoir painted them. Waltz music begins to play, and the characters glide about the floor. When the music stops, they move back to their places in the painting. A few seconds pass and they step out and introduce themselves. They tell enchanting stories of their evening in Paris, 1883. When they finish, the models pause and come out of character. They introduce themselves as art experts from The Living Art Museum. They tell the history of Renoir’s life, and classify and critique his painting. Then they explain what their job as an art expert at the museum entails. Before they leave, they invite the students to create their own Living Art Museum and leave them with directions on how this can be accomplished. Study the elements of art and design. Become art experts and learn to see the world through the eyes of an artist. Bring paintings to life by portraying people and writing their stories. Study master artists lives, art styles, techniques, works of art. Learn how the artists work and think. Learn to classify and critique art. 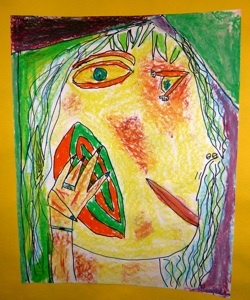 Use the elements of art and design and the artists’ techniques to design and create works of art. Explore the art through a variety of disciplines. Create a museum to educate others. Students accept the challenge and the study begins. Writing, poetry, music, and drama are integrated into the Storyline. An incident occurs during each artist study. In the context of creating an art museum, students acquire an in-depth art background as they learn to describe, analyze, interpret and judge works of art. 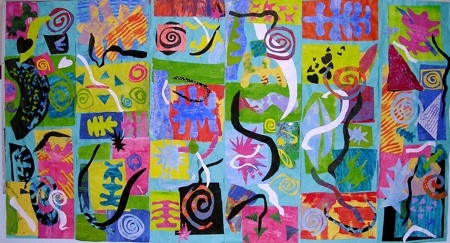 Art projects are designed by the students using their growing knowledge of the elements of art, design and artist techniques. Sample, student-designed, art projects, are presented in the book, but each art project is uniquely designed by the new class of students. Following the Storyline, students are ready to build on the ideas they have learned and experienced. The study of the masters has provided them with models for technique and style. Now the students are ready to use their mentors’ ideas as a framework on which to climb to new levels of thinking and learning in all areas of study. Student sketch of The Fiddler. Monet lily mural created by students.